Around four years after the Government Digital Service was established and 18 months after Policy Lab was set up, design is growing ever more visible in the work of civil servants, not just as an expertise they can buy in, but one that should be developed as mainstream inside government. GDS’s focus on researching user needs and iterative prototyping has resulted in more usable, accessible and effective digital services that make good use of limited resources. 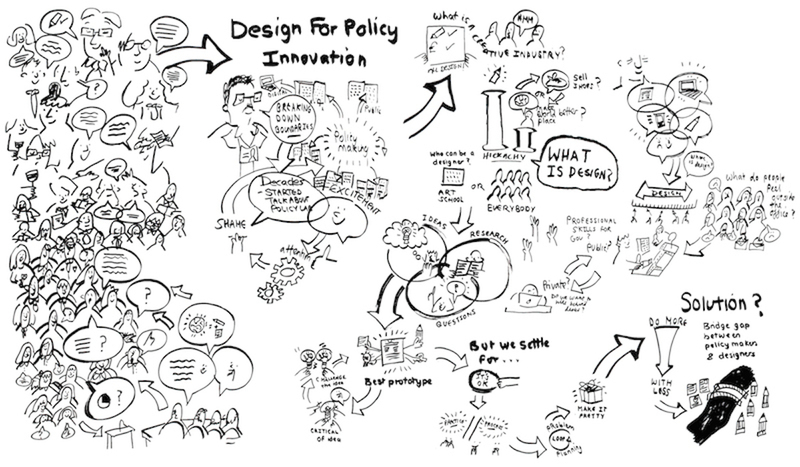 Policy Lab’s work has shown how design approaches are relevant not just to digital services, to the policy profession. Based in the Cabinet Office, Policy Lab works with departments applying a range of methods and tools upstream at the early stage of policy development shaping analysis and idea generation and closing the gap with delivery through iterative cycles of prototyping exploring different solutions. A packed room in Whitehall in early October brought together over 90 people from policy and digital teams in government departments, academia, think tanks and consultancies to make sense of the opportunities for design in relation to policy innovation. The occasion was the launch of a report summarising my AHRC research fellowship in Policy Lab, available here. Paul Maltby, director in the Cabinet Office, opened the evening by reflecting on his work across government. “Whilst we did think about the users of services, so much of our attention was on the machinery of government. What I’ve learned from working with Policy Lab is seeing a moment happen when policy officials begin to understand things from users’ perspectives and say ‘How come we have never done things like this before?’” Three speakers then brought into view some of the opportunities and challenges posed by bringing design expertise into government and in particular policy making. Next up was Mat Hunter, director of strategy at Central Research Laboratory, former chief design officer at the Design Council and previously at IDEO. Mat shared reflections of how government departments are changing based on experience of collaborating with them including on a “living well with dementia” design challenge. These days, he said, civil servants have to be policy entrepreneurs, digital gurus as well as understanding design. Of these three, design is the least understood and the most fragile but perhaps the most essential. “Central to design is understanding what it is to be human, and that is phenomenally complicated.” He drew attention to how current commissioning and procurement processes get in the way of government being experimental. Hearing from these experienced professionals brought to light the range of contexts in which something called “design” is now operating. Arguably design in its different guises – whether as design thinking, service design, or human-centred digital design – is on the ascendant internationally in government innovation teams as the LabWorks 2015 event in the summer seemed to suggest. What people hope and expect from it is not just insights into user needs or ideas on post-it notes. Instead, it’s a collaborative activity for inquiring into problems and solutions.